Chillers are products that provide temperature-controlled circulating fluid to control the temperature of heat sources in devices and equipment. As many models incorporate a heat source as well, they are also called circulators. Maintaining a fixed temperature can improve the quality, reliability, and service life of equipment. Also, by utilizing a closed loop cooling system, the cost and environmental impact of running cooling water to drain is avoided. The HRS Chiller Series offers four nominal cooling capacities (1.2, 1.8, 2.4, and 5 kW) to serve a wide variety of applications. They utilize a refrigeration circuit to achieve temperature stability of +/- 0.18 deg F (0.1 deg C) within an operating range of 41 ~ 104 deg F (5 ~ 40 deg C). The compact design of the unit as well as the efficient design for shedding waste heat allow them to be placed under workbenches and in close proximity to one another. While designed for years of trouble-free service, the HRS features a robust self-diagnostic program to quickly identify issues. 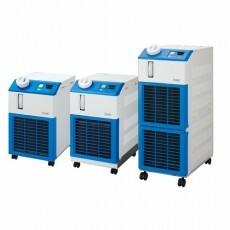 These easy to use units are an outstanding value that can improve many processes via efficient temperature control. Proven performance with a wide range of applications such as lasers, analytical equipment, LCD manufacturing equipment, etc.